Sage 100 ERP (formerly "Sage MAS 90 / MAS 200") offers a broad range of features and functionality for core accounting, business intelligence reporting, customer relationship management (CRM), eCommerce, Project Management, HR and payroll, manufacturing, and distribution. 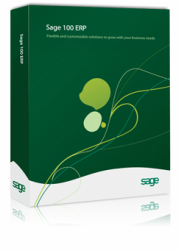 Developed for companies that need a wider range of features than "off the shelf" accounting like QuickBooks can offer, Sage 100 ERP provides the flexibility to choose features and modules that best suit your current business needs - along with the flexibility to expand and add functionality as your business grows. Five core modules - Accounts Receivable, Accounts Payable, Bank Reconciliation, Fixed Assets, and General Ledger provide a strong foundation for business growth. Power up your entire manufacturing process with manufacturing software that drives productivity and provides detailed, accurate tracking and reporting at every stage. Efficiency for all stages of the production with Bill of Materials, Work Order Processing, and Material Requirements Planning is accessible. Post production procedures can be handled with full integration with Sales Order, and Inventory Management tools to make the manufacturing process work smoothly. Business Insights Explorer is a managerial tool helping in the decision making process. Additional business intelligence tools include Business Alerts, Business Insights Reporter, Custom Office, Data Migration, F9, Microsoft FRx, and Visual Integrator all of which can provide actionable knowledge of all business activities. Tracking time used, processing payroll, managing resources, and increasing profitability is easier than ever. Choose the level of time and project management tool you need - Payroll, TimeSheet, Job Cost, Electronic Reporting, and Time Card. CRM solutions can centralize and organize contacts, marketable resources. With CRM, businesses can track marketing campaigns and manage customer service efficiency. CRM solutions will boost business continuity and return on investment. Sage 100 ERP Standard (formerly Sage MAS 90) A good choice for companies that are growing, adding employees, processing more transactions, need better reporting and business intelligence, and have simply outgrown QuickBooks. It's cost-effective and powerful. Offering all the features of the Standard version, Sage 100 ERP Advanced (formerly Sage MAS 200) also boasts a more powerful engine using a client/server platform for increased processing power, elevated system performance, enhanced data integrity, and remote access support. A good fit if you simply need more processing power or have multiple offices or employees that need remote access to the system. Sage 100 ERP Premium (formerly Sage MAS 200 SQL) combines the all the best of the Sage 100 ERP Advanced, adding the power and efficiency of Microsoft SQL Server. Just leave your name below and one of our Sage 100 ERP experts will follow up with you shortly.